“Peg + Cat: The Eid al-Adha Adventure,” a brand-new picture book based on the multiple Emmy-winning series on PBS KIDS, is now available. In the new book, Peg and Cat are invited to Yasmina and Amir’s celebration of a very special holiday, Eid al-Adha. Amir explains that dividing meat into three equal parts and sharing one third with someone less fortunate, is an important holiday tradition. But, Peg and Cat discover a REALLY BIG PROBLEM when they realize all three bowls hold different amounts of meat. It’ll take a balancing scale, a trip to a soup kitchen, and an unexpected visit to a neighbor to solve the problem. The first time I heard of Eid al-Adha was when I received this book for review. Eid al-Adha, also called the "Festival of Sacrifice", is the second of two Islamic holidays celebrated worldwide each year, and considered the holier of the two. It was celebrated on August 20th of this year. 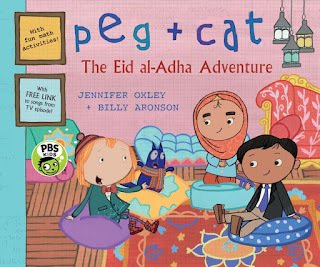 A hardcover book that explores another culture, Peg + Cat: The Eid al-Adha Adventure has Peg and Cat meeting up with two friends during the Eid al-Adha holiday. Yasmina and Amir explains that it's about lots of food and presents, but it's mostly about giving to those with less. As part of their tradition, all meat is divided into three equal parts. One-third is kept by the family, one-third is given to the neighbors, and one-third is given to someone who has less. (Side note: This is a part of the holiday that I'm in agreement with.) The group used number skills and a pan balance to equally divide the meatballs. Once equal, the group distributes the meat. They learn to solve problems using math and they learn that it's fun to give to others. I like that this book explores people and traditions from another country. I like the lesson learned that giving to others feels good. And I like that there are visual math equations throughout the book that young readers can learn from. One person will win a hardcover book copy of Peg + Cat: The Eid al-Adha Adventure. I received book from Candlewick Press. The opinions within this post are of my own and I was not influenced in any way. Please do your own research before purchasing products or using services. Your opinions and results may differ. Good way to learn about another culture. "Leave a comment on this blog post with whether or not you're familiar with Eid al-Adha OR comment with your favorite holiday to celebrate." I believe Eid is the feast at the end of the Ramadan fasting period. The Indian actor Shahrukh Khan holds a big Eid celebration, and I've seen pictures of this. And my favorite holiday is Christmas, with Santa and gifts! I am familiar with this cartoon, I have watched it on PBS with my kids! I did not know that they have a book series though, thanks for sharing! I am not familiar with Eid al-Adha but hope to be soon. I have to admit that I am not familiar with Eid al-Adha. It'll be interesting to learn along with my niece what it's all about. My favorite holiday is Thanksgiving. For me, it's all about the stuffing! I am a bit familiar with Eid. I know kids get candy around Eid. My fav holiday is Thanksgiving and Christmas because of family times! !